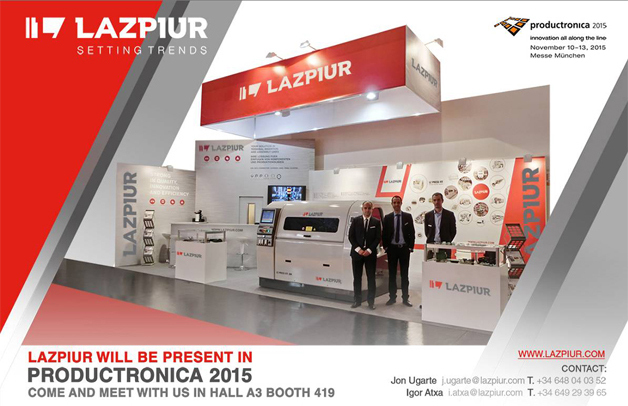 The Basque company Lazpiur attended with its own stand (A3.419) at Productronica from 10 until 13 November. This is the leading exhibition in the sector in terms of both the number and quality of exhibitors, particularly in the machinery sector. Lazpiur, one of the leading international component inserting machine manufacturers, presented the newly-developed Press-fit machine. The electronics sector convened from 10 until 13 November in Munich at the Productonica exhibition, the most important international exhibition in this sector, both in terms of the quality and number of exhibitors. Lazpiur attended it once again as it has done on a regular basis since 2007. On this occasion, the Basque company, one of the most prestigious international inserting machine manufacturers, presented its entire range of specific machinery for electronic products. The main highlight this year though were their newly designed Press-fit machine. Lazpiur has designed a new evolution with new features. Amongst other advantages, the new prototype permits up to four heads instead the maximum of three up to now. It also includes a PCB rotation system such that terminals can be inserted on both sides. Lazpiur has adapted to market demands to integrate new advances to their machines, already boasting a proven quality track record. The Basque company attended the exhibition this year with an appealing stand to meet the number of requests they have received from major companies in the sector to attend and present their latest innovations. Amongst others, Lazpiur's officials had meetings with multinationals such as Hella, Continental, Leoni, Bosch, Delphi, Magneti Marelli... Most of these are already customers of the Guipuzkoa-based company. Productonica played host to 1200 exhibitors from 39 different countries and 37,880 visitors from over 80 countries. The fair spaned over seven pavilions with a total surface area of 77,000 square metres. State of the art technologies and innovations in terms of equipment for electronic product production were exhibited at Productronica. Electronic component mounting machinery (Lazpiur’s own products) through to dosing machines, varnishing machines, circuit testing machines and cable crimping machines could be found in Munich. The fair also showcased laser machines, printed circuit manufacturers, laser printing products and machines, suppliers of items for machines (robots, linear guides, pneumatic items...), etc.